Writer’s block is REAL. I’ve been thinking about this article all week and while there is so much to say about the Thermal Trail XP50, I’ve had the hardest time putting my thoughts into words. It could be that I’ve had this infatuation with this thermal when it came out last year and have watched hours upon hours of YouTube videos of other people piling up pigs with it. Maybe it’s that the XP50 thermal I used was chock-full of so many bells and whistles that I can’t adequately write about every single one of them here. I’m really not sure why this has been a struggle but I do vividly remember that early Saturday evening, the sun was still up, and I just finished scanning the empty 135 acre field that was 3.5 miles west of the farm and started to piece this XP50 story together in my head. I climbed in the truck and drove north on the county road towards the highway and began to make a mental list of the features that I really wanted to discuss when I wrote this article. At first, I thought that I would talk about a couple of features but the more and more I thought about it, the longer and longer the list was getting. 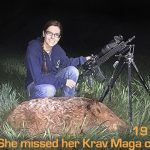 So while I believe this optic has EVERYTHING you could possibly want in a thermal, here I’ll share what I discovered while actually using the Pulsar Trail XP50 for hog hunting. To say that I was excited was an understatement. I was making the 45 minute drive south to pick up some Pulsar gear from Sellmark in Mansfield, Texas. Part of my excitement was that I’ve been virtually stalking (YouTube, Instagram, hunting forums, optics forums, and anywhere else I could get my fix) their new thermal products that came out last year and the other part was I had no idea what I was picking up. Does anyone else like surprises? As I am buzzed into the lobby at Sellmark, I introduced myself to Stephanie and let her know that I am there to pick up some equipment from Kevin Reese. She called Kevin to let him know I was there and asked me to take a seat. After a few minutes, Kevin waltzed into the lobby with two small, mysterious, black bags that he plopped onto the counter. Out of the first bag, he pulled out the Pulsar Helion XP38 (more on this later), which is one of Pulsar’s handheld thermal units. The more and more I hunt with thermals, I realize that a good handheld thermal is almost a necessity. Kevin then unveils the contents out of mystery bag #2, the Thermal Trail XP50, Pulsar’s flagship thermal scope. I could not wait to get out into the wheat fields and try this bad boy out. But first Kevin gave me a quick tutorial and then we chatted for a bit before I was out the door and headed back home. I came home to grab my rifle and removed my Vortex Viper PST 1-4 from my AR-15. The weight of my optic and mount was 23.3 oz. while the Trail was only a couple of ounces heavier. I was kind of concerned about the weight of the Trail because of all the bells and whistles that Pulsar was able to pack into this thermal. I’ve used more expensive thermals that were lighter but didn’t have all the features of the Trail and I’ve also used less expensive thermals that are several ounces heavier and have most of the same features as the Trail, but were lower quality products. Saying that, the Pulsar Trail XP50 is right in the middle of the pack as far as comparing it to the weight of other thermals on the market. As far as the length of the Trail, it is just under 12 inches. Now, I will call this a false length because the rubber eyeshade on the back extends from actual body of the trail an additional 3-4 inches. So while the Trail XP50 looks really long, about ¼ of its length is the rubber eyeshade. Also, the eyeshade is firmly attached to the unit. I can’t tell you how many eyeshades/eye pieces have fallen off in the blackness of night while I’ve hunted. It seems to me that most thermal companies should send a disclaimer saying, “While we can’t promise you it will happen, you are more than likely going to lose your eyepiece.” With my rifle and the Trail in hand, I headed to Proactive Defense to sight in the thermal. I got to Proactive early and wanted to familiarize myself more with the Trail’s menu and options. As I pressed the power button on the right side of the thermal, the Pulsar emblem lit up the display. I flipped open the lens cover and inspected my surroundings. Using the diopter adjustment ring (found between the eyepiece and the thermal), I turned the knob until the display was in focus. I then worked my way towards the front of the thermal (as instructed by Kevin) and found the lens focusing ring and gently rotated the dial until my display crystal clear (the resolution is 640×480 and it has a 17 micron core). Moving on top of the thermal unit, there were a total of 4 other buttons. From front to back they were Up, Menu, Down and Record. Some of these buttons did more than their name suggested. For example, the “Up” button obviously navigated up once I was inside the menu but it also was the button you pressed to determine if you wanted your display to be white hot or black hot. After navigating through the menu for 10-15 minutes, I felt pretty comfortable with knowing where everything was and operating the unit. While zeroing, I did break one of my cardinal rules of not bringing something that emits heat (hand warmers, a pair of connected 9 volt batteries) to use as a target. We ended up using a piece of tin foil but the sun really wasn’t shining this day so I had trouble detecting the foil. With the help of Justin and Casey and a lot of ammo, we were able to get the Trail XP50 sighted in. I was happy and eager to get home to pack and leave for the farm in the morning. It was about 6:30 on Friday night and a couple of locals, David and Caden, had joined me. There was a very small group of 4 sows and probably about 20 tiny piglets in the Porcupine Egg field. When we first spotted this sounder, they were about 400 yards south of us into the field. The wind was in our favor and with a little bit of light left, we decided to go after them. As we got within about 100 yards of the pigs, 3 of the 4 sows simultaneously dropped to the ground to nurse. I had never seen anything like it. It was like they were auditioning for synchronized swimming for the Olympics. It was one of the oddest things I have ever seen. We thought we could close the gap and quietly marched forward, but not quietly enough. One of the sows heard us, popped up and suddenly they’re moments from bailing on us. David and I recognized what was about to happen and we quickly, but safely train our weapons on the hogs and shoot. We both hit the same sow and were happy with getting at least one of the hogs given the speed at which things escalated, but our conversation returns to the synchronous sows. We returned to the house, grabbed a quick dinner and headed back out to the fields once it’s dark. We loaded back in the truck and head to the CRP. While most of this area is very, very flat there is a little hill (and I use this term very loosely) where I park the truck and I scanned the 120 acres. There’s a lone boar less than 200 yards from us and a larger group on the far west side of the field. Since Caden didn’t get a chance to shoot the last go around, we decide to let the young teenager to shoot this boar. Wind was in our favor, we even had a little bit of brush to hide behind and get about 75 yards away. Caden was using the NiteSite Eagle RTEK on his .243 bolt action rifle. It’s no thermal, but it works in the right circumstances. He got the boar in his scope, slowly pulled the trigger and smacked the boar. It was a good shot, but the boar sprinted west towards the other pigs and we just shook our head in disbelief. I scanned the field and watched the wounded boar exit the field to the west of us, but the other group of hogs have not vacated the field. They were about 600 yards from us and while I was fairly certain they were hogs, I wanted to double check. Normally, the magnification is 1.6 on the thermal but it does have 2x, 3x and 4x magnification and I was able to use the 4x or 12.8 magnification to verify that they were hogs and so we headed their direction. Everything was in our favor but as we got about 65 yards from them, something spooked the hogs. They were feet from the fence and in a blink of an eye, they were in the safe zone. I was dreading the walk of shame back to the truck. As we walked back, I replayed Kevin’s instruction in my mind about the onboard recording settings. Yes, the Pulsar Trail XP50 has onboard recording. There was a picture mode, video mode and another video mode (which I don’t know and can’t find the name of, so I’m going to call it active recording). I could cycle through the different modes by pressing and holding the “Record” button until it changed to the next mode. I knew I was using “Active Recording” when there was a little bullet next to the video recorder image in the top left corner of the display. With “Active Recording” the camera is always recording but when you or someone next to you fires their weapon, it saves a few seconds before the shot and an undefined time after the shot. I don’t know how many times I’ve used other thermals or night vision that have either a built-in recorder or a mini DVR attached and I forgot to hit record on an awesome hunt, but those days are over. I tell you that because the first two hunts of this trip were not recorded. We are over halfway back to the truck and I decide to scan the field again and a portion of the hogs we startled just a few minutes ago were back and they are closing in fast. They were moving from west to east and were moving along the fence on the north side of the field. Even though they were coming right to us, we had to get in position to make sure there weren’t any cattle behind them when we started to shoot. Once in position we began the countdown to shoot… 3, 2, shoot! The first shot is a little premature and the hogs are off. They ran every which way but towards us. I panned to my left and started to fire at some of the hogs that were on the run. I ended up downing two of the smaller ones out of this group. We snapped a couple of pictures and then it’s off to the next field. As we drove to the next field, I discovered that if I pushed the Trail XP50 power button it would go into “Display Off” mode. Basically the thermal was still running but no images were being displayed. I don’t know how much battery life this saved but I never had an issue with battery life. I will need to test the battery life again because I didn’t stay out all night. I hunted for about 6 hours on Friday night, recharged the battery during the day on Saturday, and went out for 3 hours on Saturday night. Yes, I did say I recharged the battery. No more carrying a pocketful of CR123’s or AA’s in your pocket. No more buying batteries by the pallet. Just plug in, use, and recharge. We came to the western most field that we hunt. The same field where I started piecing this story together the next evening. As we pulled up to the entrance, there was a boar no more than 30 yards from us that took off immediately. There were still about 40-50 hogs that were oblivious to our presence. Now there 40-50 hogs are scattered ALL OVER the 135 acres. We picked a small group that was relatively close to us but our timing was just not good. I think the three of us fired at three different times and somehow we all missed our shots. The hogs all across the field panicked and yet I managed to pick one off a couple of hundred yards away. Maker Bullets .223 seems to do the job nicely as long as I do my part. It was a good night but it was time to turn it in. The next night I went out solo. It was a great night where I ended up killing 5 pigs and one coyote. I really was able to utilize the picture-in-picture mode. This is when a magnified image of the reticle appeared at the top of the display. I was able to “zoom in” while still having a great FOV. I love this feature. 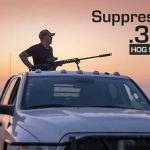 I returned to my new honey hole that is west of the farm and wasn’t surprised that hogs were in the field. It was super windy and the weather was starting to get bad so I had to do act quickly. There were a couple of hogs about 200 yards from the gate. I started moving. I was about 50 yards when I setup to shoot and really focused on utilizing the PIP for these shots. I exhaled but was still kind of shaky (I really do need a better tripod) and fired and hit the first hog. The 3 hogs darted south, I shot again and the first hog is down, shot again and the second hog went down. 3 shots, 3 hits and 2 dead pigs. For me, that’s not bad. At this point, the wind is so strong that dust is no flying around everywhere and I decide I’m done. -3 Different Zeroing Profiles (Up to 5 distances per profile) – Why I do like this feature? I will say that if my Trail was going to be bouncing between several guns, I would purchase a ZroDelta DLOC-PTM mount from Tyler over at Ultimate Night Vision. This would not only ensure that the zero holds but also makes it much easier to move the thermal from gun to gun. The Pulsar Trail XP50 retails right under $5000. Thermals will run anywhere from $1800 to over $10,000 and just like everything else, you get what you pay for. However, to find a thermal in this price range that not only produces a great image but also includes onboard recording, rechargeable battery, picture-in-picture and many other features is hard to find. 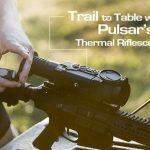 Remember that this is Pulsar’s top of the line thermal and they have other Trail models that prices start in the $3500 range. I had to take this one back, but soon I hope to give it another run! 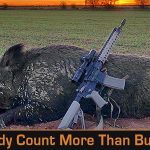 This entry was posted in The Accidental Hunter - Jared Hilton and tagged Hog Hunting, Hunting, Maker Bullets, Pulsar, Tactical Hog Hunting, thermal, wild hog hunting by Jared Hilton. Bookmark the permalink. This sounds like my story but I ended up with the XQ38. I just noted the tinfoil for sighting in. This is what I used at night and it was pretty good. I have heard of people using a cigarette as well but each to their own. I also agree this in any version is a tight unit especially the sighting profiles as mine moves between a rimfire and a centrefire on QD mounts. Holds zero pretty good too. Well good luck with it all! Thanks! I am really liking mine. Hopefully I can get my hands on the LRF version.